and at our house this weekend, i woke up, sniffed my nose in the air, and proclaimed, “it’s brisket weather.” with that i trotted off to the butcher who had cleaved and wrapped seven and a half pounds of pure red steer, laced heavily with adipose. he marked it, mahany, and as he handed over the white-paper-wrapped log, he raised one eyebrow and quizzed, “that jewish?” well, no, mister meat man. but my husband is, my boys are half and half, and we do hanukkah. the thing about being an irish catholic mother in a jewish-catholic family is that you have no long lineage of recipes you call your own. you have, forgive me for braggin’, something far better than that: an amalgam of adopted jewish mothers and the best of their best. i’ve got ina’s matzo balls, aunt joni’s tips on storing, freezing and reheating latkes, liat’s hamantashcen, audrey’s “tzimmes with potato kugel topping,” that one cut from the los angeles times, now yellowed and long ago scribbled with audrey’s thoughts on how to improve it. brisket i’ve got in triplicate: susan’s famed brisket, one boasts; sandra’s working-woman’s brisket; and the one i now call my own, brisket from harlene ellin’s mom. now, mind you, i have met harlene ellin’s mom once–at the side of a pool at a 7-year-old’s birthday long long ago, where the meeting was doused liberally in chlorinated pool water. but harlene’s mama and i, once or twice a year, we make brisket together. listening closely as she insists it must be heinz chili sauce, nobody’s else’s. following carefully as she guides me through the rinsing and patting dry of the beef slab. last night, i leaned heavily on mama ellin. she swears you need 50 to 55 minutes per pound in a 325-degree oven. do the math: that was 6 and a quarter hours. being a good catholic girl, i did what i was told. even though after a while i started doubting the wisdom of all this baking and baking. was i en route to the leatheriest brisket ever served at a hanukkah dinner? as i unearthed said brisket from the oven, well past bedtime, and noted the bayleaves had started to blacken, my knees how they trembled, my calm how it shattered. quick, i grabbed mark bittman. he tells me how to cook everything. he said nothing about brisket being cooked for a full quarter of a day. i googled brisket. the longest stretch there was five hours, for a five-pound brisket. but i had the motherlode of all briskets. my meat man set me up with 7.5 pounds, for cryin’ out loud. i had no option last night but to stay the course with mama ellin. i did as i was told, vaulted it from roasting pan to refrigerator pan, tucked it in under a taut aluminum blanket, turned out the kitchen lights and hoped for the best. frankly, my brisket dreams did little to soothe me. called the butcher first thing this morn. he swears i did the right thing; only he cautions a low long oven is the best route to brisket heaven. he goes overnight at 200 degrees. has brisket by the mound for breakfast, he does. maybe i should have turned down the heat. all i know now is it smelled a bit like heaven around here for six-plus hours on sunday, all chili sauce, red wine, cloves and those bay leaves. i wasn’t about to lower the burn on that celestial scent. we had 12 coming for brisket tonight, but little tedd has a fever of 103. so, for now, me and my brisket we are on hold. we are whispering prayers, jewish and catholic, for fork-tender, melt-in-your-mouth, mind-if-i-help-myself-to-more. dinner is rescheduled for wednesday. we’ll let you know if our brisket prayers they are answered. Rinse brisket and pat dry with paper towels. In a small bowl combine chili sauce, brown sugar, wine and water. Mix well. 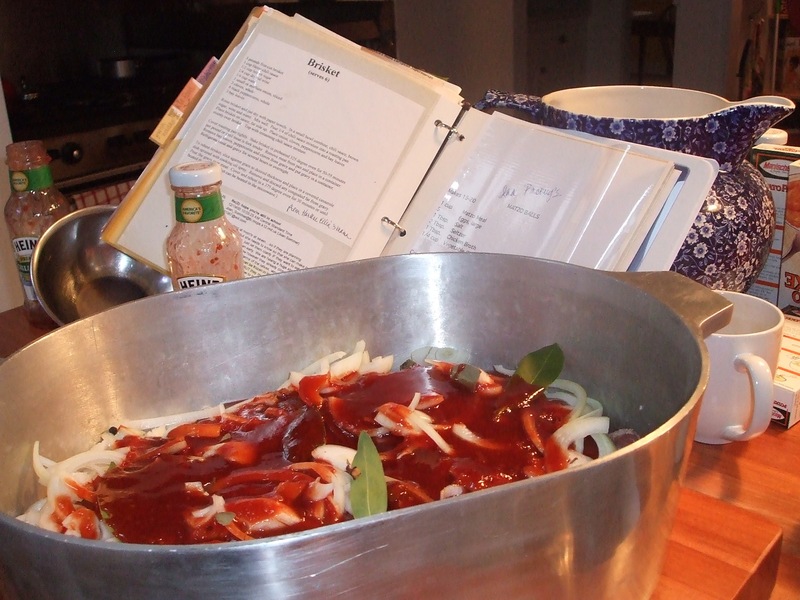 Pour ¼ of chili sauce mixture into a roasting pan. Place brisket on sauce, fat side up. Place onions, cloves, peppercorns and bay leaves evenly over brisket. Top with remaining chili sauce mixture. Cover roasting pan tightly. Bake brisket in preheated 325 degree oven for 50 to 55 minutes per pound, or until meat is fork tender. Remove meat from pan and place it in a container. Remove bay leaves, peppercorns and cloves from gravy, and put gravy in a container. Refrigerate meat and gravy for several hours or overnight. feel free to add your brisket thoughts to this melt-in-your-mouth conversation…. precious, in the sense that a rare jewel is precious. and the beauty of a jewel is its facets, the many, which cannot be taken in from one angle. such is life. we gasp at pure beauty, taken aback, in the best sense. so too this writing. and i trust the taste was sublime. and give thanks for sharing the recipe. it’s now on our list of things to do. I had one of the most delicious briskets I had ever tasted on Friday night and I inquired about the recipe. Some combination of Coca-Cola, ketchup, mango chutney, and both dried onion and mushroom soups. So not a natural recipe for me. Cooked about the same as yours. But I gotta say that any recipe of Babsy’s turns my head and I am considering jumping ship on the delectable Friday brisket and using yours tomorrow at our little family gathering. Will let you know. Anyone for great latkes? A Jew who doesn’t know how to cook Jewish, I am. wm ulysses, er, mr. grant, you make me blush. far too kind. blessed jan, we went for the manishewitz, “quality since 1888,” jitterbugging in grease, er, holy oil. boys were licking their lips. we’ve done ’em the knuckle-bleeding way, too. i prefer the latter. me, i like a little crunch with my latke. not so keen on the corpuscular bits that come with the knuckular loss. but you take what you get when you haul out the box grater. on a quest for the holy latke…. Of all the wonderful threads so far, I have chosen to enter the blog world with comments about brisket. Kinda sad, but safe and it would make my dearly departed Grandma Ethel chuckle because the family lore is that I once asked her if she ever cooked anything else. OK, I happen to be a fan of the small brisket and will cook two or three if it’s for a crowd. No big dutch oven here, just an 8 x 11 pyrex dish per brisket. Easiest thing in the world to make and it always good. Sprinkle with lots of garlic powder, throw on a jar of chili sauce and a package of onion soup mix. Douse with worchester sauce and add some water, or better yet, ginger ale. I suppose the carbonation works as tenderizer. Cook it for 2-2.5 hours at 325. Then put it in the fridge overnight to let the fat harden, skim off the fat, slice it thin on a slant and against the grain and then put it back in the oven at 300 until it’s tender. (Sometimes I will add the gingerale (or, I confess, a coke or pepsi) after it’s been sliced instead). BUT, I must say I am intrigued by the addition of cloves because I happen to have about 4 McCormick containers of whole cloves in my kitchen because whenever I’m in the grocery store stocking up that one-time recipe calling for cloves, I buy them because I can never remember if I have them. I am beyond that now and just want to use them up so maybe they will be added to the next brisket. darling susan, remind me to tell you about smell, my signature pot on the stove all through the winter…..it uses cloves by the handful. i love it. so glad you got your brisket out there–it really does deserve to be called famous. it is SOOOO good. i was trying to figure out where i could tuck your recipe on an already too-long post. and, voila, you took care of that for me. merci. besides, i knew nothing of the gingerale, carbonation thang, so it’s better that you put up the recipe, or else we would all be lacking for bubbly things….grandma ethyl would be so so proud…. this just in from my swedish covenant darling neighbor and friend: while freaking out because said husband was stuck at work with the only latke mix left in town (the stores around here they were fresh outa hanukkah fixins), puts lips to my ears to whisper the great secret recipe for latkes out of what’s lurking in the freezer. tater tots, friends, that’s what i wrote. she takes tater tots, lets em thaw, mashes em, adds egg (maybe two eggs for half a bag of tater tots), tosses in enough flour to hold it together, a few drops of milk if it’s too held together. from there, it’s standard latke procedure: oil to fry pan, when it’s hot enough to sizzle a drop of water, plop in the tater-tot latke blobs. watch ’em fry. the verdict: “hey mom, these taste like tater tots with scrambled eggs.” (that kid, he’s a genius.) “hey, these are great,” chimed in one guest. and from the most skeptical mouth at the table: “hmm, these really are good.” all i know is the great swede got me out of a no-latke crunch. i told her she needs to call the tater tot people and get her gorgeous mug plastered on the front of the bag, touting her “these make for great latkes!” holiday message.